Cheteshwar Pujara and Virat Kohli have dominated day two. INDIA'S two best batsmen are threatening to grind Australia's star-studded attack into submission, having easily piloted the tourists to 2-277 at lunch on day two of the third Test. Cheteshwar Pujara, who batted for a total of 11 hours at Adelaide Oval in a man- of-the-match effort that helped India to win the series opener, was unbeaten on 103 after facing 294 balls. Virat Kohli is 69 not out and demonstrating similar patience at the MCG. 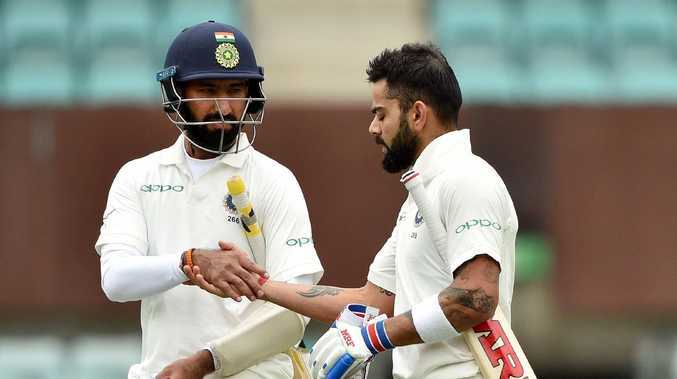 Pujara brought up the 17th Test ton with a sweetly timed straight drive off Nathan Lyon, as Kohli closed in on the outright record for most Test centuries in Australia by an Indian. Kohili, dropped on 47 by Tim Paine late on day one, and Pujara enjoyed a chanceless start to day two as they built an unbeaten 154-run stand. The venue's docile drop-in pitch continues to prove the stuff of nightmares for Mitchell Starc, Josh Hazlewood and Pat Cummins, who have already delivered a combined 68 overs in the match.